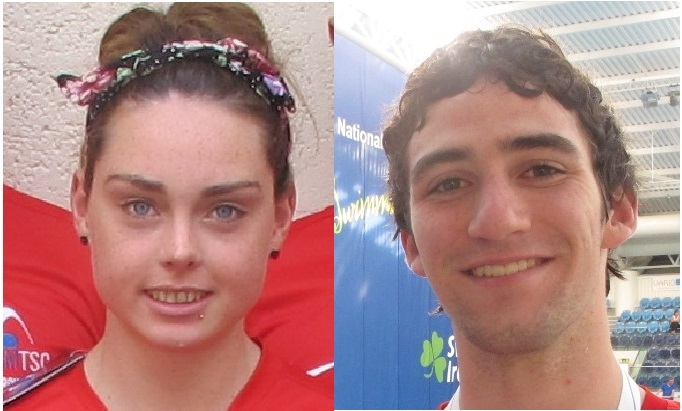 On the final day of competition at Irish Age Group & Summer Open Championships at the NAC today, Niamh Murphy (19) and Tiarnan Murphy (19) unrelated, delivered a superb set of Gold Medal performances in their respective ‘favourite’ events tonight with Niamh hitting the wall in top position in the 50FC while Tiarnan finished in the Gold medal spot in the very other end of the distance spectrum in the 1500FC, his second year in succession. The final day of competition set a very similar tone to that of the earlier days as the TEAM of 23 delivered multiple PB’s in their events. The day kicked off with the 200IM , where Ellen Walshe (11) delivered a strong swim after a busy weekend of racing to finish in the 4th fastest 11yr old on the day. Muirin Goulding (14) also delivered another PB for her self in the same event while Jessica Burke (13) delivered another fine performance and a PB equalling effort as she finished as 8th fastest in her age on the day. In the older age group Dayna Clegg (17) posted a solid effort as Alison O’Driscoll (17) also delivered a strong swim int he heats to qualify for the ‘B’Final tonight to deliver an equally strong effort. In the Boys event Cathal Tan (15) continued his 100% PB record as he again set another best time by over 3 seconds, while Graham Field (19) delivered a qualifying swim for the’B’ final tonight where he finished 8th in a strong time, but a little outside his best. In the Sprint freestyle event Rebecca Burke (14) continued to add to her list of PB’s this weekend as Dayna Clegg & Alison O’Driscoll also posted solid heat swims, but Niamh Murphy (17) set herself up in the morning with a good heat swim, to comfortably qualify for the Semi’s and having progressed to the final in the last event of the day, set a fantastic new PB to take the Gold medal. In the boys event Graham Field (19) swam a PB in his heat, while John Martin (19) had to wait till the Final this evening to deliver himself a well earned PB swims and an 8th place overall finish as he had posted a strong heat & semi-final effort en route. In the last stroke event of the weekend Jessica Burke (13) added another PB to her list as she swam to a new best time in the 200BS to finish as 4th fastest 13yr old while in the boys event Ruairi McCarthy (14) was delighted with his new PB effort , and Cathal Tan (15) yet again took 6 seconds off his standing best time, while Jonah Clegg (16) posted a strong heat to qualify for the finals but opted to focus on his more favoured distance event where he demolished his PB in the event in the 1500FC to finish in the top 10 in his age group. In the girls event Caoilfhinn Tan (13) swam her first Long course 800FC and posted a time some 12 seconds inside her entry time, while to finish off the events for the weekend Tiarnan Murphy (19) took Gold for the 2nd year in a row in another strong performance for him int he 1500FC. After 4 long days of racing, the TEMPLEOGUE athletes head back to training before a holiday break, while Niamh Murphy heads to the UK to swim as part of the Irish Athletes competing in the British Youth Championships. A great competition to end the year for the team with a huge number of PBs all told.